The most glamorous Grand Prix and to make the most of your Monaco weekend why pack into the public grandstands with everyone else? With Wildside you will be watching from a private boat exclusively reserved for our group in the prestigious Monaco harbour. This really is for the privileged few. A quick wave of your special pass and it’s through the checkpoints and restricted access areas by the F1 pits and along the quayside to the Wildside yacht. Crowding is not a problem as we strictly limit numbers so there is plenty of room on board. The bar is open and drinks are free all day from 10am until 6pm. Mid morning snacks are offered followed by a fine gourmet lunch with lobster, hand carved ham, beef, wines and delicate desserts – served and finished with ample time before the race gets underway. 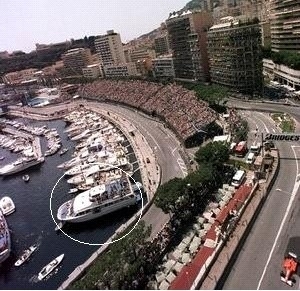 The privately chartered boat is moored in a superb spot at Tabac corner (see circle in photo) a matter of feet away from the track. You will have a close up uninterrupted view at one of the best corners on the circuit (rated by Martin Brundle as the toughest on the track) as the cars brake hard from the straight after the chicane before powering off down to the swimming pool complex. Although you are right up close to the action it’s vital to keep in touch with what’s happening around the track and the harbour’s giant TV screen above the famous tunnel chicane will keep you informed throughout the race (backed up by live feed monitors on the boat). From the deck you can view the Tunnel exit and the chicane before the short straight into Tabac and away. After the race it’s champagne and a private post-race party on a hotel roof top overlooking the harbour. Wildside will of course treat you in fine VIP style throughout with superb 5 star hotel accommodation on the Mediterranean coast and VIP chauffeur transfers. It’s a first class experience all the way. This is one weekend you won’t forget.